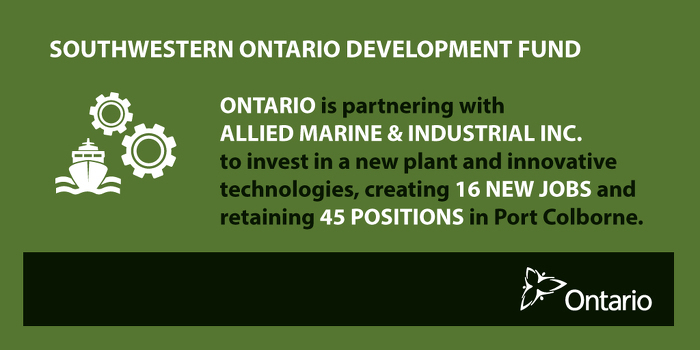 November 8, 2016 2:00 P.M.
Ontario is partnering with Allied Marine & Industrial Inc. to invest in a new plant and innovative technologies, creating 16 new jobs and retaining 45 positions in Port Colborne. Allied Marine & Industrial provides technical services to both marine and land-based industries in southern Ontario, including mechanical, machining, custom fabrication, manufacturing and field services. The company will move its tooling, machining, fabrication, assembly and storage buildings into a new state-of-the-art facility in Port Colborne with support from the province. The facility will be equipped with new machinery and innovative technologies to expand operations and meet increased market demand in the heavy fabrication and machining sector. About 90 per cent of Allied Marine & Industrial’s marine side of the business comes from the Great Lakes region of Canada and the United States. Ontario is investing $462,874 from the Southwestern Ontario Development Fund for this project. The project has a total eligible value of over $4.6 million and is expected to be completed by July 2017. Since 2013, the Southwestern Ontario Development Fund and Eastern Ontario Development Fund have helped to create and retain more than 32,500 jobs and attracted approximately $1.58 billion in investment. The funds cover up to 15 per cent of eligible project costs, with the recipient company funding the remainder from its own resources. President and CEO, Allied Marine & Industrial Inc. This document was published on November 08, 2016 and is provided for archival and research purposes.